It’s been a little while since I have had a chance to post on the blog here. Tonight I wanted to remedy that with a quick look at some early Disney Four Color comics. 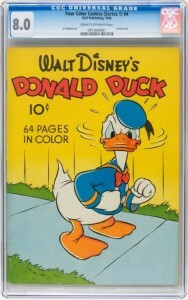 As you probably know, Four Color Comics were initially issued in a “series 1” which ran from 1939 to 1942, and then a “series 2” which ran from 1942 through 1962. It’s not clear to me why George Delacorte (the publisher of Dell comics) did this, but so it is. The series 1 books are hard to find and it contains some rather iconic books. 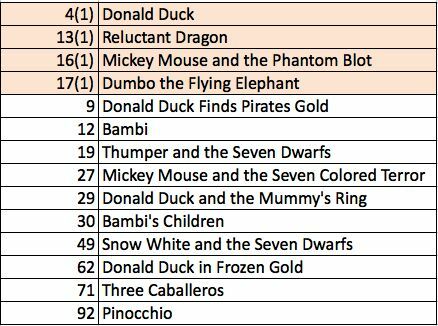 Issue #4 has Donald Duck by Al Taliaferro, Issue #16 has Mickey Mouse by Gottfredson, and Issue #17 is the first Dumbo comic. Series 2 has Issue 9, the classic Donald Duck Finds Pirate Gold story by Carl Barks and Jack Hannah. Issue 29 has Donald Duck at the Mummy’s Ring by Barks. The table here shows the featured subject for all the titles in the graph below. If we take a look at the CGC data on these books, it comes up pretty much as we would expect. There is one datapoint though that is worth taking note of if you are looking to add these books to your collection. Looking at the data, we instantly notice the spikes in CGC submission where the books contain more popular characters. This is a no brainer…we expect this. 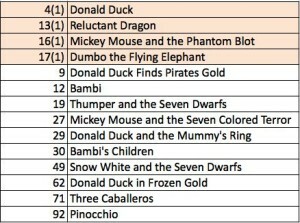 Let’s face it, Donald Duck is a more popular character than Dumbo. 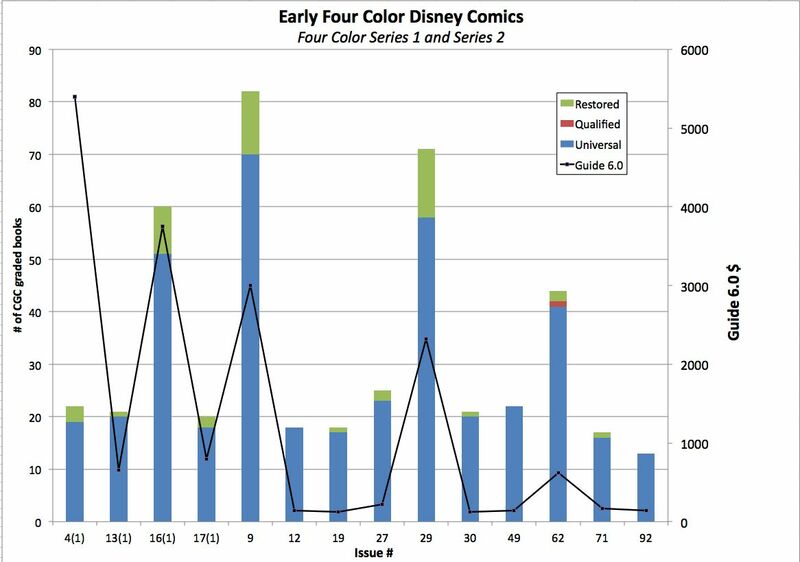 And it is Donald Duck in Four Color series 1 #4 that yields the most interesting datapoint here. This is the highest priced book in this group, but it only has a total CGC submission of 22 copies. That is low. Bottom line…I suspect there aren’t that many raw copies of this book out there, so this book is truly rare. As an aside, Gerber list the rarity of this book at Gerber 7…so take that for what you like. The issue in the picture above sold at Heritage in 2009 for just under $20K. It is one of two books graded at 8.0. There are none in a higher grade. Anyway…I will be looking at Walt Disney Comics and Stories in the near future as well. The earlier issues of that run are also difficult to come by, but you do see them every now and then. It will be interesting to see what the data has to say! P.S. Check out these Four Color Disney Comics on eBay! This entry was posted in Dell, Four Color and tagged Disney Comics, Donald Duck. Bookmark the permalink.